Politics and Personal Driving Preferences: Do Republicans and Democrats Drive Different Cars? Dodge Rams are the most popular car in Republican states; the Toyota Prius is the most popular in Democratic areas (as are hybrids and foreign cars). During his keynote speech at the 2004 Democratic Convention, then Senator Barack Obama complained that “the pundits like to slice and dice our country into red states and blue states.” Obama argued that Americans have much more in common across geography than they do differences. We decided to test the president’s supposition in terms of the cars Americans drive. Are red states and blue states really that different? Do common stereotypes likes the Prius-driving Democrat and truck-driving Republican stand up to analysis? At YourMechanic, we have a massive dataset with the location and details about the cars we service. In order to understand what people drive in red and blue parts of the country, we took the locations of these cars and mapped them to their state and congressional district. We began by analyzing the most unusually popular cars in each state and whether the cars in states that supported Obama in 2012 were different from those that did not. The most unusually popular car is defined as the car which is most over-represented among our YourMechanic users compared to the national average. The map at the beginning of this article and table below displays the results. One of the biggest differences between the most unusually popular car in red and blue states is the likelihood of the car being American made. While three quarters of the most unusual cars in red states are American made, this is true of less than one third of those in blue states. The other major difference is size. The most overrepresented car in a red state is more than three times as likely to be a truck or sports utility vehicle than those in blue states. On a state level, the cliches seem to hold up. But would they if we zoomed in a little further? Going beyond state, we mapped each car we have serviced to a congressional district using the zip code of the car’s location. If the car was located in a congressional district that elected a Democrat (201 districts), we consider it a blue car, and if the car was located in a Republican district (234 districts), a red one. Of course, even in a Republican held district, there are still many Democrats, even if they are a majority. Still, this method gives us an even better sense of what people drive where a certain party predominates than just looking by state. 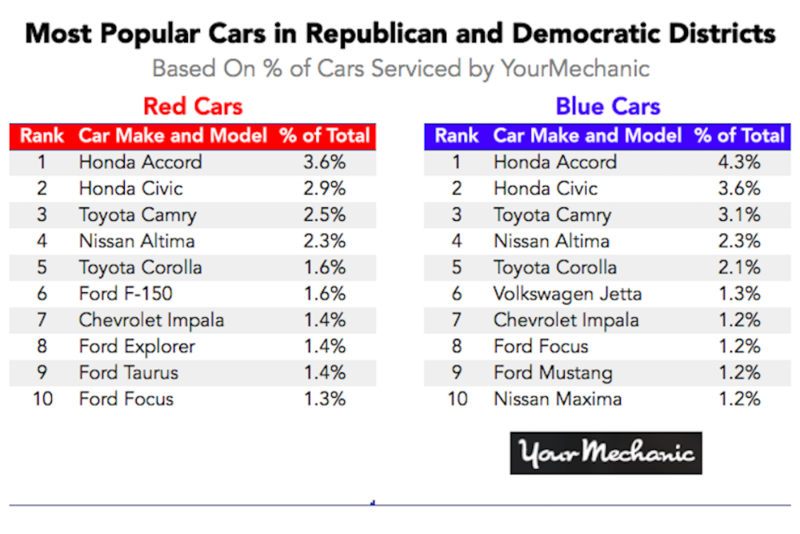 The following table shows the most popular cars in red and blue districts. The absolute most popular cars are quite similar. In fact, the top five are exactly the same. Regardless of their political affiliation, the Americans we service are more likely to drive a Japanese sedan than any other car. Towards the bottom of the list, we begin to see some contrast. The sixth car on the Republican list is a Ford F-150, perhaps the most iconic American made pickup truck. This car is 16th in Democratic areas. The sixth car on the Democratic list is the Volkswagen Jetta, a car with a reputation for being exceptionally safe. Conversely, this car is 16th in Republican areas. But the real differences are revealed when we look at the cars that are most distinctly blue and red. 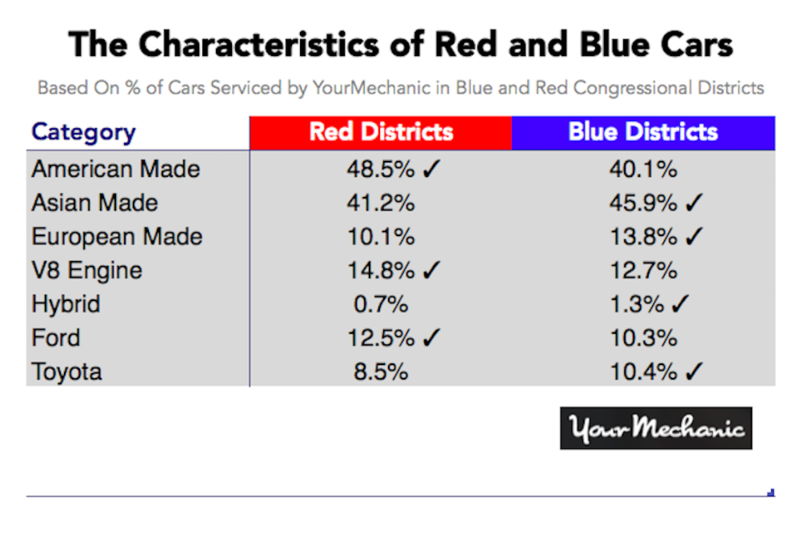 Similarly to our state level analysis, we analyzed the cars which are most unusually popular in red and blue districts. We determine this by comparing the percentage of each car in Democratic or Republican areas versus the overall average. Now, this list is very different! The cars that are most unusually popular in red states are all trucks and sports utility vehicles (SUVs), and nine of the ten are American made (the Kia Sorento, an SUV, is the exception). 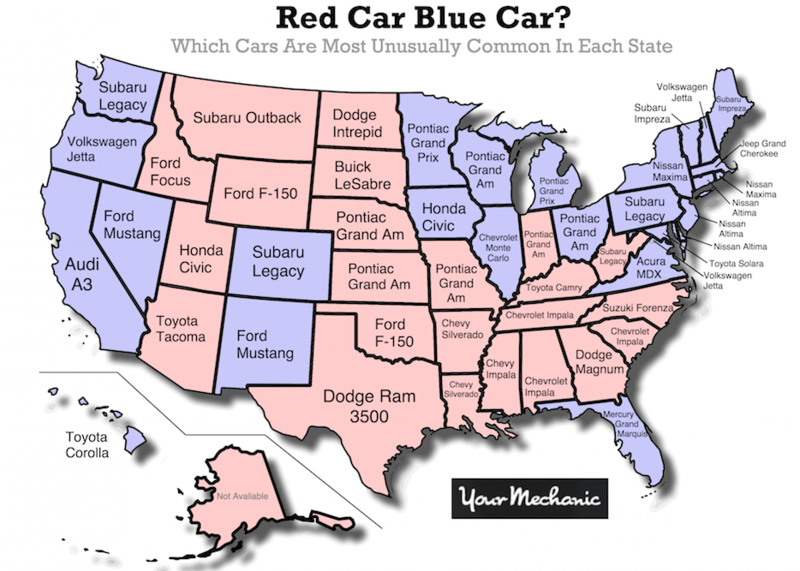 In contrast, none of the most most unusually popular cars in Democratic areas are American made or trucks/SUVs. The list of unusually popular cars in Democratic areas is entirely made up of foreign made compact, sedans and minis. These lists are further evidence that there is often a grain of truth in stereotypes. The Dodge Ram 1500 and the Toyota Prius, the most unusually popular cars in Republican and Democratic areas respectively, are emblematic of the differences the cars driven in these places. 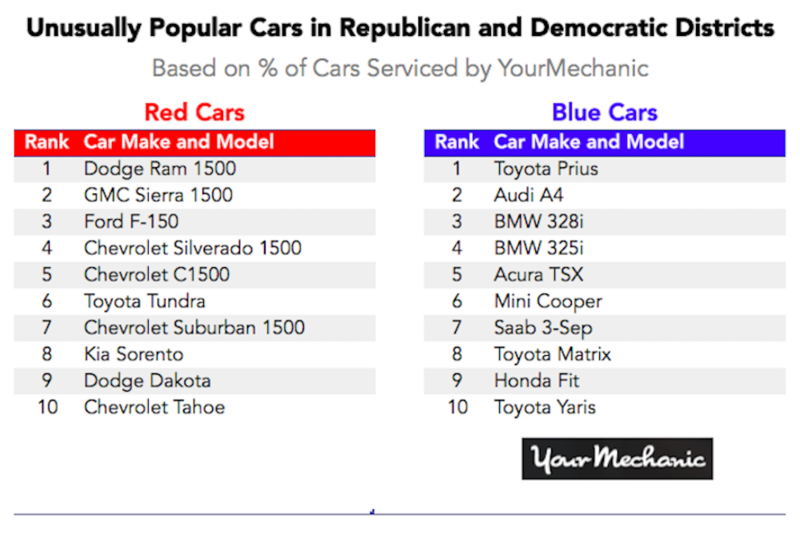 The table above shows that cars in Republican area are substantially more likely to be American made and have V8 engines (typical of SUVs and trucks, but not exclusive to them). Cars in democratic areas are much more likely to be foreign made and double as likely to have a hybrid engine. In the end, in terms of the cars we drive, Obama was only partly right about America truly being purple, rather than divided into red and blue. People everywhere in the United States drive Prius’s, trucks and mini coopers, but whether a place is politically red or blue can tell us a great deal about just how likely they are to drive them. Q: What does it mean when your check engine / VSC lights are on? Q: How do I insert a CD?